Dried fig is the soft and sweet edible dehydrated fruit of the tropical ficus tree native to Asia and the Mediterranean region. Many varieties of figs exist although the dried white fig (Chinese Dried Fig) is the type commonly used in Chinese cooking. As the name implies, the white figs are pale in color. They are also less sweet as the Western variety. to the Chinese name of 無花果 which literally translates to “flower-less fruit”. Figs can be eaten fresh or dried. They can also be used to make jams or soups. A vast majority of figs are dried since the ripe fruit does not transport well. When picked, fresh figs do not keep well either. Figs are one of the highest plant source of calcium and fiber. According to the USDA, dried figs are a rich source of fiber, copper, manganese, magnesium, potassium, calcium, and vitamin K relative to human needs. Dried figs also contain smaller amounts of many other nutrients and antioxidants like flavonoids, and polyphenols. Some studies have suggested that dried figs can help fight cancer and reduce blood pressure. In Chinese medicine, dried figs are classified as a neutral food (yin yang balanced) and known to moisten the lungs and relieve coughs. 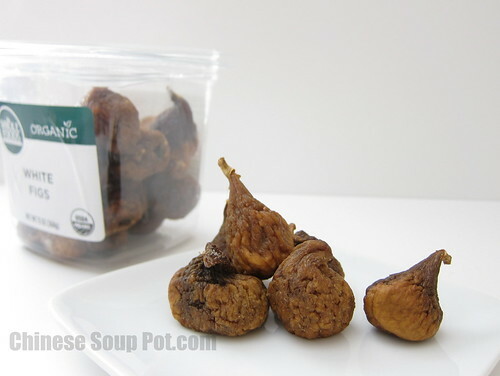 Chinese dried figs are also said to invigorate the spleen, cleanse the intestine, detoxify, and ease swelling. (Western medicine also recognizes dried figs to have laxative effects). See a list of my recipes using dried figs. Since dried figs are often preserved with chemicals, I prefer using organic dried figs over the non-organic type. 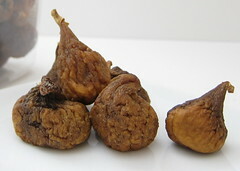 Organic dried figs do not need special preparation before cooking. They can simply be added to your cooking as the recipe calls for. Non-organic dried figs should be rinsed and soaked in cool water for a few minutes before cooking. Fresh figs can be purchased seasonally at local farmers markets, in some Western supermarkets (like Whole Foods) or at some large Asian supermarkets. Dried figs (organic and non organic) are typically available year round and can be found at Western supermarkets like Whole Foods, Asian supermarkets (herbal ingredient section), or online. Use fresh and dried figs in moderation as it is known to have a laxative effect. How do you use your Dried Figs? Leave a comment below to share your ideas. Link to this page from your site or recipe! Guess too many of these would send straight to the bathroom! Good to know these other benefits. I’ve never tried figs–I really should, shouldn’t I? My husband loves them though! I had no idea that they were from the ficus tree OR that they’re really just a cluster of flowers and seeds, not fruit. It’s so interesting to learn about dried figs. I’ve never tried dried figs before about I love fresh ones so why not. It’s really impressive to learn about the depth of Chinese herbal medicines. See, I did not know that these little guys are packed with wonderful nutritional benefits. Thank you for sharing these valuable information, Sharon! I love dried figs but didn’t know about all the nutritional benefits. Thanks for the information!